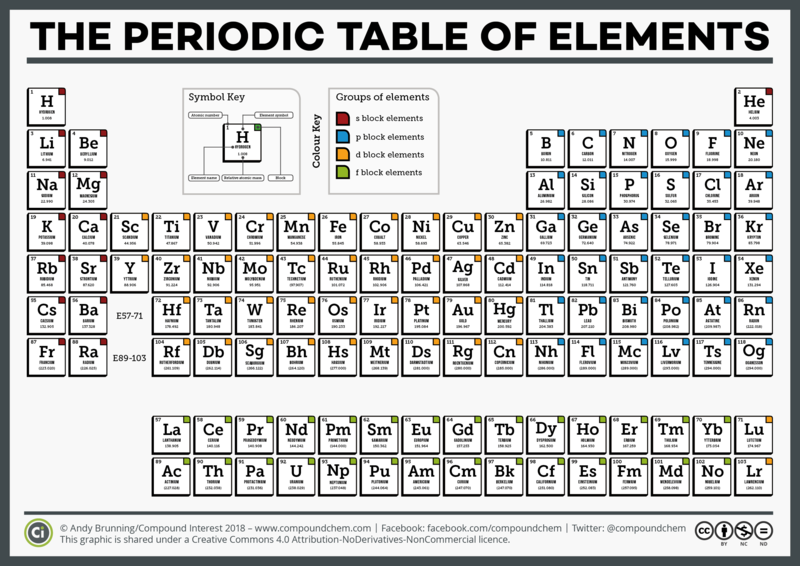 National Periodic Table Day – Six Different Periodic Tables! Today, February 7, is National Periodic Table Day. You could be forgiven for not knowing – it was actually only ‘founded’ in May 2015, so this is only the second time it’s rolled around. February 7 was picked because it marks the date on which John Newlands’ first periodic table of elements was published way back in 1863. By happy coincidence it’s also only a day before the birthday of Dmitri Mendeleev, the scientist most famously associated with the periodic table. 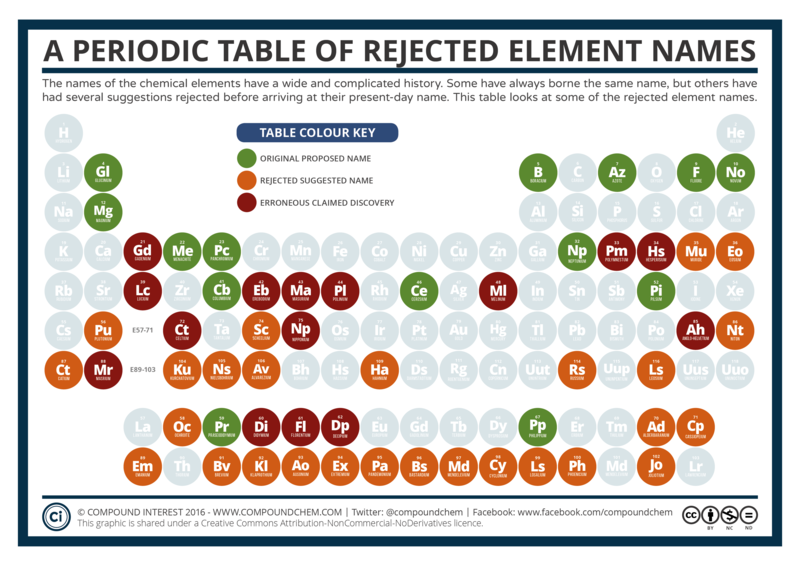 To mark the occasion here are a selection of periodic tables I’ve made over the past few years, which include a serious look at element properties, and a not-so-serious look at the names for newly-discovered elements that were rejected over the years. The periodic table has actually only just been ‘completed’ in the past year. Four new elements had their discoveries and names confirmed in 2016, and replaced the last few placeholder positions in the table. I say ‘completed’ because scientists are still trying to create elements beyond element 118, so in years to come an extra row may be required to accommodate new element entries. 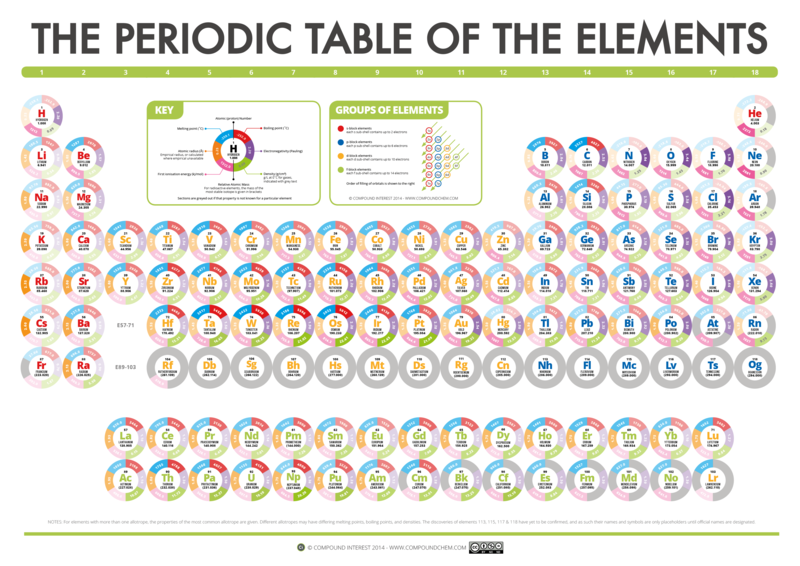 Here’s a periodic table that’s crammed with data. 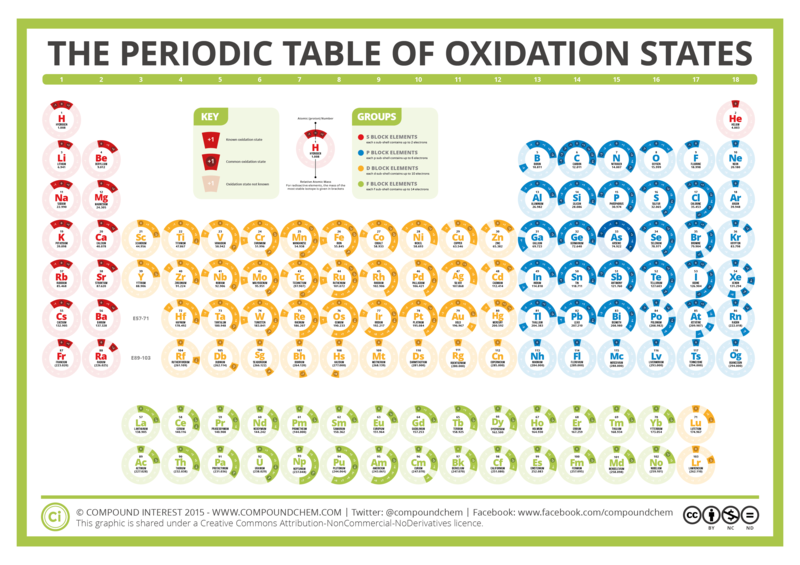 It includes the melting point, boiling point, density, electronegativity, radius, and first ionisation energy of each element in the table. 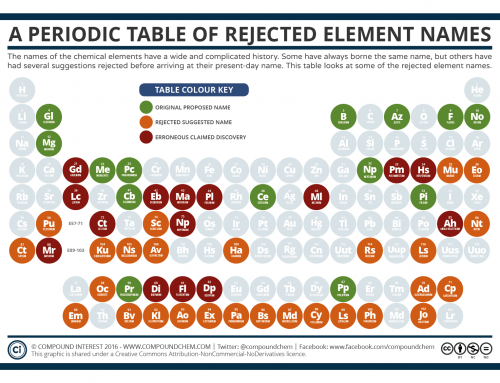 It’s also colour-coded to show how these properties vary from element to element. Download this table and find out more about it here. 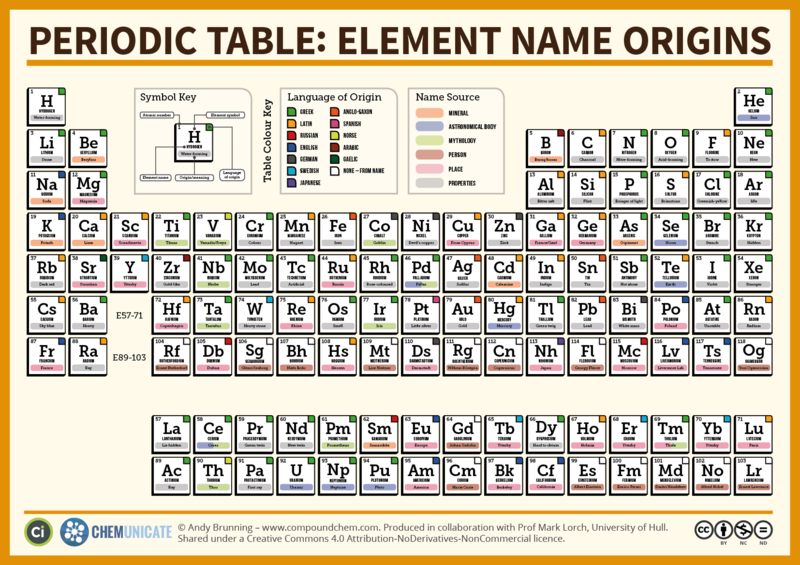 The origins of the elements’ names are varied both in terms of language and in terms of what they were named after. This table, created in collaboration with Prof. Mark Lorch from the University of Hull, tries to pin down where those names come from. There’s also an accompanying explanatory poster on why some elements have symbols that don’t match up with their names. 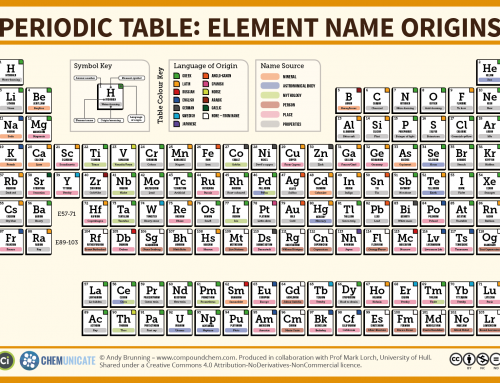 For elements discovered more recently, a catalogue of names have been seriously and not-so-seriously suggested before the official names were confirmed. Past elements, too, have been subject to naming variations, be it due to simultaneous discoveries, language differences, or scientific squabbles over the right to name the element in question. This table looks at a selection of these ‘rejected’ element names. Not all of the elements in the periodic table are plentiful. 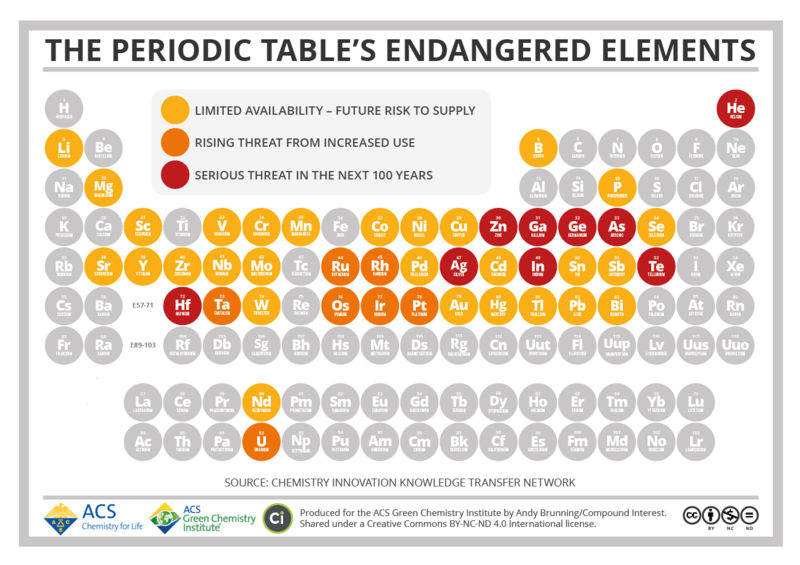 While we will not ever truly run out of an element, some are considered endangered in the sense that in the future they may be too spread out and costly to extract. 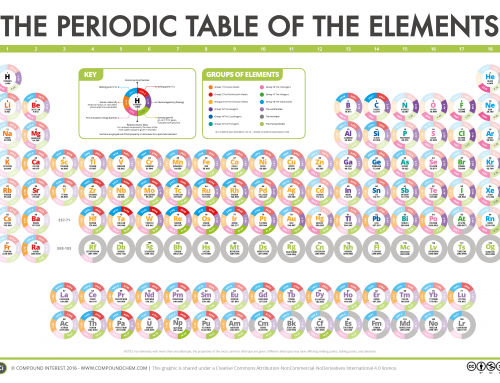 This table, made in collaboration with the American Chemical Society’s Green Chemistry Institute, takes a look at the elements considered to be most at risk. 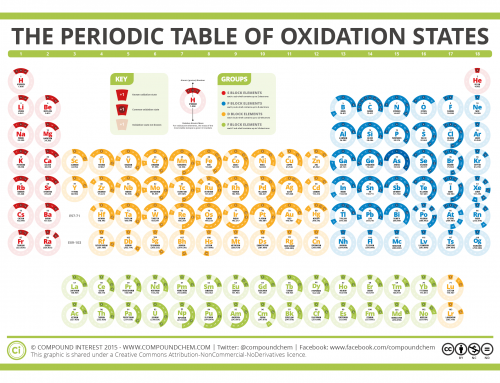 This last one shows the various known oxidation states for the different elements in the periodic table. It’s probably of more use to the chemists out there than for general interest; still, if you are curious as to what it depicts, there’s more detail in the original post.